We are surrounded by plastic! Plastic bottles, plastic toys, and plastic everything else. We try to be Eco-conscious and recycle but is there a way to take it one step further? When it comes to dispensers, I am a big believer is reusing a dispenser and buying your products in bulk to reduce the amount of bottles used. Although, what happens if we don’t have a nice looking soap dispenser? I have a chic project that will make all those ceramic and glass dispensers envious of this look. 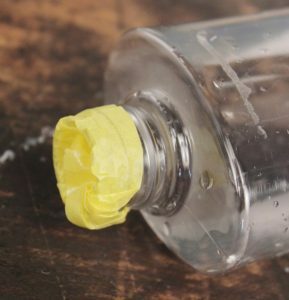 Unscrew the cap and empty the soap from the container into a cup. Remove the labels and thoroughly wash the inside and outside of the soap dispenser container. Let dry. 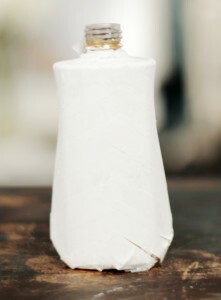 Cover the opening of the dispenser using masking tape and apply 2-3 coats of spray paint to the container. Let dry. 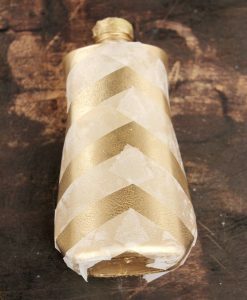 Create a chevron pattern using clear or masking tape on the front and back of the container. Using a small craft paint brush, paint the exposed areas in white. 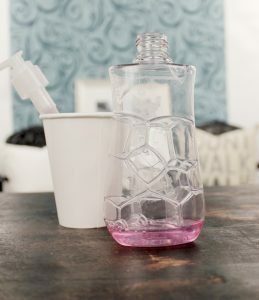 Remove the tape, and spray the soap dispenser with a clear finish to protect the paint. fill the dispenser with soap and screw the cap/pump back on. Place the dispenser in your bathroom and enjoy!